Worse and worst are two words that are homophones. Homophones, which are words that have the same pronunciation but have different meanings and spellings, are often baffling to people. You might even be asking yourself, “Should I use worse or worst?” We will tackle each word to know how to use them. This tastes worse than last week’s drink. His acting skill is getting worse every time. Kaya’s attitude is worse than Mary’s. I don’t think Ara’s hair is awful. I’ve seen worse. Worst is a superlative adjective, which is an adjective that is used when you compare three or more things with one another. Just like worse, it functions as a noun, adverb and adjective. It is the superlative form of bad or ill and is the opposite of best. Plan 9 from Outer Space was crowned as the worst movie ever made. The worst thing you can do is to run away. It will break her heart. The devastation caused by Typhoon Haiyan was the worst. Pizza Corner had the worst service ever. The two words worse and worst are very similar, which is why most people get confused. Although the words have similar meanings, they are also very distinct. So what is the difference between worse and worst? 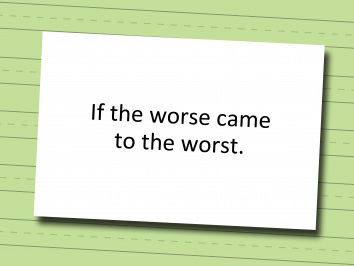 Worse is an irregular comparative adjective, while worst is an irregular superlative adjective. When we say irregular, that means it doesn’t follow a set of rules. Regular comparative or superlative adjectives add -er or -est (e.g., larger, largest) or use more/most (e.g., more beautiful, most beautiful). The illness was worse than she thought. You’re making the situation worse. Lena’s scores are worse than mine. When she walked into his office, I feared the worst. That was the worst singing voice I’ve heard from you. When you look at all the papers, my handwriting is the worst.